Hi, this is a very flattering style, size 16, lined, loose fit. Excellent condition. 94 cm length measurement from the shoulder to the hem. Ladies' Black & Brown Aztec Print Jacquard Midi Dress from Next, Size 12 Tall. Only worn once or twice so still in generally excellent condition. Just a couple of small pulls to the fabric (see final photo) but these are probably fixable if you know what you're doing with a needle & thread - I sadly don't! Oversized Tunic Dress. Grey, Cream & Black. Knee Length. Short Sleeve. Nice soft material and a wide floral fabric pleated band at the bottom. Length 35". buttons to open. elasticated cuffs. ladies next dress size 14. Condition is Used. Dispatched with Royal Mail 2nd Class. Uk buyers only please. Pretty Pink Ditsy Floral Dress by Next. Perfect for Spring. Textured fabric. Excellent quality linen and design. with concealed side pockets. Next, Size 18, Monochrome Dress. Short zip to back. Two pockets (one to each side), Elasticated waist with draw-string style fastening. Hardly worn. No known defects. New Next Tall Shift dress. My friends and I are having a clear out! Casual office wear. NEXT SUMMER BOUTIQUE Ladies Pretty Blue Floral Beach Dress Size 18 Length 52” Please ask any questions you may have about this item. I do try my best to check my items & put an honest description, but as all humans I can make mistakes and maybe miss something. If you do have a problem with an item, please contact me within 7 days of receiving your article and I will do my upmost to rectify the issue. I am happy to combine postage for multiple items. Thank you for reading to the end. It is size 10 eu 38 from next. It is size 12 Tall eur 40. Next ladies 3/4 fluted sleeve tunic dress size 16. The dress features a ribbed band neckline, and two silver zip pockets that go through to the other (1 large front pocket pouch). It is size 18 eur 46. Nice and flowy maxi dress by Next. Lovely colours like sunset. Sleeveless with cut out detailing on the back. Relaxed fit. Fully lined. Style: Long Maxi Dress. Patern: Striped. Colour: Orange/ Dark Brown/ Black. X2 Next ‘Tall’ Tunic Dresses size 14. The grey dress is in good condition but has a slight imperfection on the front as shown in photo. The green dress is in good condition. Attractive Size 12 dress is from Next. New listingNext striped tunic dress. A lovely styled tunic dress with pockets that has a draw string waist. Very fresh and great for summer holidays. Pockets to both sides and looks great with navy leggings and pumps or boots. Has a blue and pink stripe pattern and white background size 16. No marks and like new. Ladies Dress. • Colour: Black, Textured pattern. • Long Sleeves Dress. • Dress Size 10. Dress size 10. • Size UK 10. we will do our upmost to resolve your concern as quickly as possible. 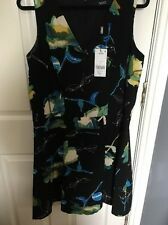 Blue / Multi 3/4 Sleeve Floral Tunic Dress By Next. Shoulder to hem 35". Pit to pit 20". Ladies Next Red flamingo print Tunic/Smock dress size 6 fully lined. Missing belt doesn't effect the wear of the item. It is size 8 eur 36. It has a scoop neck front V neck back. Next Shift Dress. Gorgeous Next dress. Dress is clipped to dummy to show how it would look when worn. Labels cut to comply with UK resale laws - care label missing. Length 35". I have other items listed and am always happy to combine postage wherever possible. Please visit my shop Elsie, Mollie & Mae to see my other items. New items are added each week - please add me to your favourite sellers and do ask if you are looking for something in particular. Please note that any jewellery shown with clothing is for display purposes only and is not for sale. Payment by PayPal only please, within 3 days of listing ending. Please do not bid if you do not intend to pay. Please do ask if you have any questions or require any further information and I will endeavour to answer as quickly as possible. Thanks for looking - happy bidding!. Green, exotic print, crinkle, tie waist, side splits, pull on style. Next Petite ladies dress. Size 14 UK. Necklace is not included. Pretty floaty beaded black laganlook Next dress. Back of the dress is longer than the front. 19" pit to pit. However there are 2 small pulls to the front which are not noticeable. Next Fit and Flare Dress. Fit and flare design. May be the odd pull if you look for it . Gorgeous Next dress. UK Size 12. Dress is clipped to dummy to show how it would look when worn. Labels cut to comply with UK resale laws. Used but in good condition. Size 14Tall. Check measurements below. Pit to pit: 25inches. Waistband across: 23inches. Shoulder to hem: 38 & 1/2inches. Please check out my other items. Happy to combine postage on multiple purchases, message for price. Any questions, please ask. Blue African/ Ankara style Print. Chiffon style material, very lightweight. Length: 124cm / 49 in.